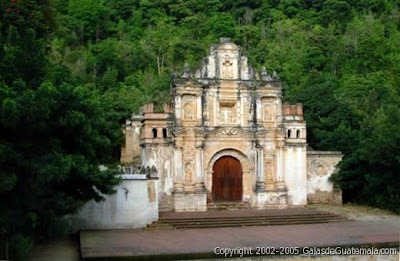 We could spend several days exploring every corner, admiring every monument, and learning about the colonial times history; however, if we do that, we would miss the essence of what Antigua Guatemala is today and why it has become more and more attractive for people from all over the world to make this amazing place their home. The arts. Wherever you go, wherever you see, you will find art in so many forms that everybody will be pleased: religious art, painting, photograph, sculpture, performing arts, you name it. Today I choose La Ermita de la Santa Cruz (The Saint Cross Chapel) as the main photo for this post, precisely because very often serves as scenario for concerts in a wide variety of genres: classical, jazz, easy listening, and some others. It has been also used for opera representations and the scenario itself is dramatic enough to let the performers shine by themselves. I am remembering now that many years ago, I was there with Alexandra enjoying a superb production of La Traviata and literally having goosebumps in this very moment. I also remember some other times with dear friends enjoying different performances using this majestic background, which has witnessed centuries of life, people coming and going... It is simply amazing! The Crafts. What can I tell you about the crafts? To start, I would say that most of the times, this classification is not fair enough. For instance, the textiles. It is necessary to be an artist to create -without following a sketch or a pattern- so many marvelous designs, combining colors and textures with perfection. For me, another example of art classified as crafts, is the wooden work we will find in many studios or shops. From candle holders to fine furniture, there are pieces worthy enough to be admired as art. Jade jewelry. From wearable jewelry to pieces intended for exhibition or collections. Last but not least, the ceramic. The mayolica-type pottery is one of Antigua's many specialties. The Culture and Traditions. The best example should be all the religious expressions especially during the whole Lent season (starting from Ash Wednesday to Easter Sunday), throughout the Holy Week, and in other popular celebrations. The photos I am sharing with you in this post are from galasdeguatemala.com and, since we are talking about art, what a better example of the art of photography. Mynor, gracias again! To show you some of Mynor's photos, which I think represent Antigua Guatemala at its best, I hope you will enjoy this slide-show while listen to the background music -another form of art, Noche de Luna entre Ruinas (title that I liberally interpreted as Moon Light Shining in the Ruins), a composition by the author Mariano Valverde, an extraordinary Guatemalan musician. Santo Domingo Xenacoj and a Bonus!